Today was weird. I finished finals yesterday, so I had nothing to do all day until a meeting for an extracurricular activity at five o’clock. I decided to make some homemade chicken stock and had the fridge cleaned out and dinner ready by one in the afternoon. Which left me three and a half hours to watch The Office on Netflix. Turns out, this salad is really, really fast and easy. I loved how light and refreshing this was – a far cry from the heavily breaded calamari and marinara that is so typical of squid preparations. Bring a large pot of salted water to a boil. Add squid and cook about one minute until tender. Check for doneness starting almost immediately, because it will overcook very quickly. Immediately drain and transfer to a bowl of ice water. Let cool. Meanwhile, combine all vegetables. Whisk together lemon juice, lemon zest, olive oil, and crushed red pepper flakes. 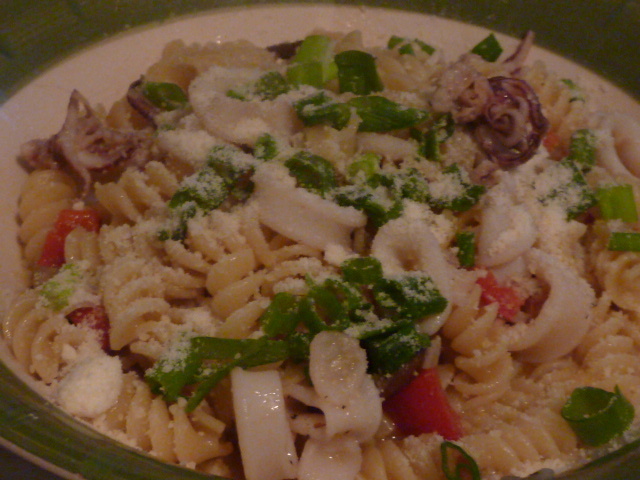 Toss together vegetables, lemon mixture, and calamari. Taste for salt and pepper and adjust as necessary. Chill at least 1-2 hours in the refrigerator before serving to allow flavors to meld. This pasta dish was so light and flavorful I couldn’t stop eating it until my bowl was basically licked clean. 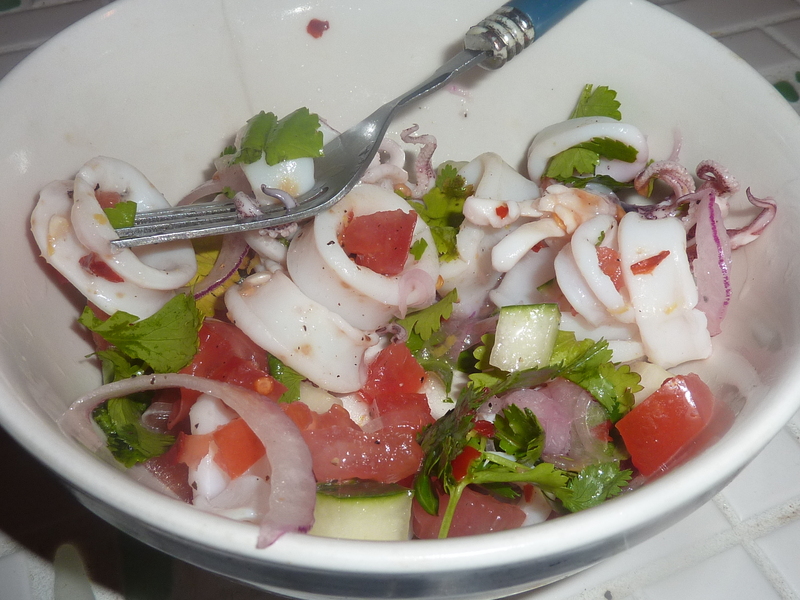 The flavors were a great balance of sweet and spice and the calamari was cooked perfectly. I was also pleasantly surprised about how well it heated up today as leftovers for lunch. Heat 1 tablespoon of olive oil and 1 tablespoon of Brummel & Brown over medium-high heat in a large sauté pan. Add garlic, shallots and whites of green onions and sauté until light golden brown, roughly 2 minutes. Add mushrooms and sauté until lightly browned, roughly 2 minutes. Add red bell peppers and hot Hungarian peppers and sauté 2-4 minutes until their juices have been released, stirring frequently. Add remainder of oil and Brummel & Brown and add calamari. Sauté, stirring frequently, about 2 minutes or until calamari begins to shrink in size. Add wine and turn heat to high, reducing by half. This should take about 3 or 4 minutes, by which time the calamari will be fully cooked. If you’re unsure, do a taste test. Add the cooked rotini to the sauté pan and thoroughly combine with the vegetables and sauce. Top bowls of pasta with green onion greens and grated Parmesan cheese and enjoy.